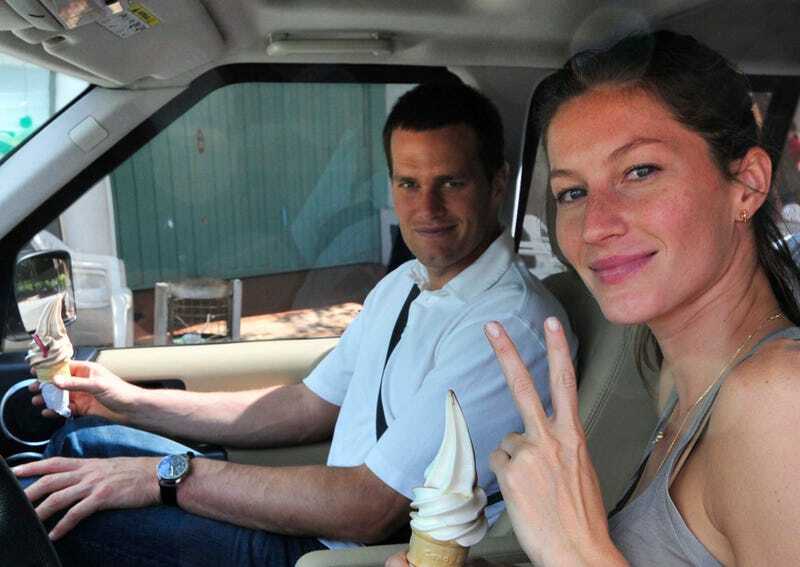 Gisele emailed some people about the Super Bowl, which her husband is playing in. One of those people forwarded it to the Post, which is how we got to where we are today. In a "disgustingly sappy email" (EXCLUSIVE//MUST CREDIT NEW YORK POST), Bundchen asked for some positive thoughts to be sent "Tommy's" way. "My sweet friends and family," the e-mail began. "This sunday will be a really important day in my husband's life. He and his team worked so hard to get to this point and now they need us more than ever to send them positive energy so they can fulfill their dream of winning this super bowl . . .
"So I kindly ask all of you to join me on this positive chain and pray for him, so he can feel confident, healthy and strong. Envision him happy and fulfilled experiencing with his team a victory this sunday. "Thank you for your love and support. Love, G :)"
Now, I'm no Augustine of Hippo, but I can easily imagine a hell where it's always the week before the Super Bowl, and the Super Bowl never comes.